High foot traffic in hotels, restaurants, shops and office buildings takes a toll on carpeting. Physical damage, spills and cleaning accidents ruin a stylish floor covering before its time. For commercial building operators, the best option to safeguard your flooring investment is a commercial carpet cleaning and dyeing contractor with the trained staff and specialized equipment to tackle these disasters and set them right. In Louisville, KY the Carpet Chemist is the IICRC-certified choice for commercial carpet cleaning and repair services. The Carpet Chemist is not an ordinary carpet cleaning company with a “one size fits all” approach to carpet cleaning and repair. 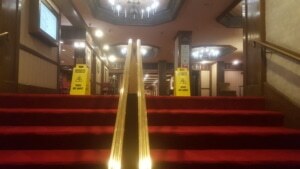 We have the equipment and expertise to clean and maintain your commercial carpets, from small country churches to gigantic high rise hotels, condos and other buildings in downtown Louisville. Armed with specialized training and detailed knowledge about the chemistry of cleaning solutions and the best methods to achieve deep down dirt removal, our team has a solution to any commercial carpet challenge. Don’t wait until your commercial carpets look horrific. The Carpet Chemist will set you up on a monthly or quarterly maintenance clean routine program, so you can enjoy fresh clean commercial carpets year round! Whether your commercial building needs a deep carpet cleaning, repair or regularly scheduled interim cleaning in foyers and lobbies, the Carpet Chemist has the staff and equipment to do the job. Partner with us for commercial carpet services that produce superior results and keep downtime to a minimum. Request an onsite consultation about our commercial services online or call (800) 515-1342 to speak with Brandon or Tonya Cerrito for a proposal and cost estimate. With the Carpet Chemist, you’ll have a partner for total commercial carpet care.